History - RotoFaze Dual Cap Owners | The H.A.M.B. Discussion in 'Traditional Hot Rods' started by Scott Mize, Aug 6, 2018. We have a Rotofaze dual cap which we are running in our 241 Hemi. 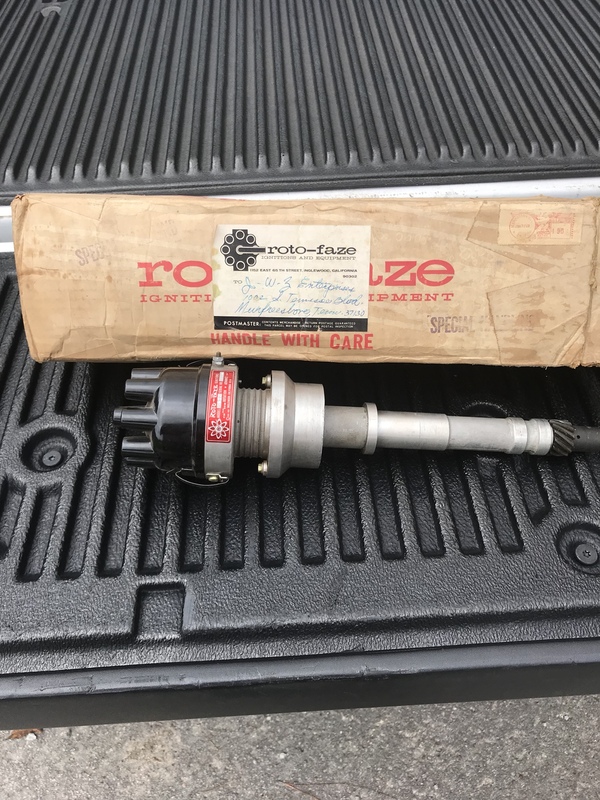 If you own a RotoFaze dual cap (operates like two 4 cylinders) please post. Thanks I know Joe. We aren’t having issues just thought a thread of owners would be cool. Those of us that don't have one, are waiting patiently for photos, Those that do, are hesitant to post photos, because it's like announcing that you keep a gold bar under your bed. Scott Mize and warhorseracing like this. Here is a video of ours on our distributor machine. Set dwell at 62 degrees, using Bosch blue coils and Taylor vertex mag condensers. elgringo71, scott27, duncan and 1 other person like this. Also. One just sold on the H.A.M.B. a few months ago for a y block. Sold first day. Just finished mounting the coils and I have to say that John and Joe at Roto Faze are super nice people,willing to help you with your distributors in anyway they can and are looking to buy some back either the dual coils or their tall distributors contact John at the shop,I know I told him good luck with the dual but maybe someone has a tall on a shelf somewhere? John’s really working on bringing back the dual coils,I’ll call and find out how that’s going and post later. elgringo71, scott27 and Max Gearhead like this. Twelve years ago I bought a Roto-Faze for a small block Chevy off ebay. I called Joe and gave him the serial number. He has log books of all the distributors and who they were sold to. He serviced it adding new components and ran it up on the distributor machine. The Roto-Faze distributors are works of art and a friend says they're built like a Rolex. Joe gave me a poster of the inner workings and although the design is many decades old there is nothing built today that is of anywhere close to the quality. Max Gearhead and mrhp like this. Thanks for adding info. I thought I found another dual cap yesterday in the box. Unfortunately it was a newer version. Postmark was 1969 and for a sbc. i'm glad you posted pics cause i had no clue. View attachment 4004217 View attachment 4004218 View attachment 4004219 View attachment 4004220 Just finished mounting the coils and I have to say that John and Joe at Roto Faze are super nice people,willing to help you with your distributors in anyway they can and are looking to buy some back either the dual coils or their tall distributors contact John at the shop,I know I told him good luck with the dual but maybe someone has a tall on a shelf somewhere? John’s really working on bringing back the dual coils,I’ll call and find out how that’s going and post later.